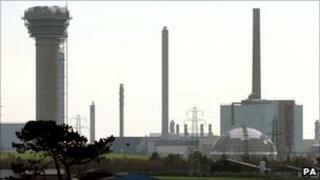 Five men are being held under the Terrorism Act after being arrested close to the Sellafield nuclear site. The men, who are all from London and in their 20s, were still being questioned on Wednesday after their arrest on Monday afternoon. The BBC understands the men were taking photographs and they are Bangladeshi. The arrests are not thought to have been intelligence-led. The men were held in Carlisle overnight on Monday and then moved to Manchester. Counter-terror detectives are continuing to search four houses in east London as part of the investigation. Scotland Yard said a small container was removed at one of the addresses. The container is being examined. Explosives officers attended as a precaution, although the container is now not thought to have had explosives or hazardous material in it. The arrests were made within hours of the news breaking that Osama Bin Laden had been killed in Pakistan, and members of the public have been warned to remain vigilant amid fears of reprisals from groups sympathetic to al-Qaeda. In a statement, Greater Manchester Police (GMP) said: "At this stage we are not aware of any connection to recent events in Pakistan." A GMP spokesman said the investigation is in its early stages and no further information will be released yet. The Sellafield site is responsible for decommissioning and reprocessing nuclear waste and fuel manufacturing on behalf of the Nuclear Decommissioning Authority. The site, which has operated since the 1940s, is heavily protected by both private security and officers from the Civil Nuclear Constabulary. Sellafield has a bunker that stores about 100 tonnes of plutonium, which experts say is enough to manufacture thousands of nuclear weapons.